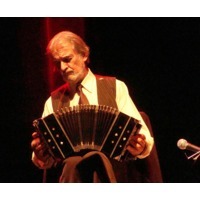 Rodolfo Mederos (born March 25, 1940) is an Argentine bandoneonist, composer and arranger. He lived in Cuba and France; in Argentina, he founded the cult group Generación Cero. As a young man he was captivated by fellow bandoneonist Ástor Piazzolla. However, he tried to transcend that influence as he strove for more. Even though he had played with Piazzolla for several years, he joined the Osvaldo Pugliese Orchestra, alongside other young musicians of his generation who shared a similar musical idea. This porteño, born in the neighborhood of Constitución, whose childhood was spent in the province of Entre Ríos, later went to the University of Córdoba to study biology. He is an outstanding bandoneon player, considered today to be among the world's best.